Anglers get the opportunity to catch a fish as big as they are! Lake sturgeon can grow to more than 6 feet long and exceed 150 pounds, and the state record sturgeon taken by hook and line was a 170-pound, 10-ounce fish pulled from Yellow Lake in Burnett County in 1979. Anglers will find a healthy lake sturgeon population on the lower Chippewa River, where the DNR fisheries crew out of Eau Claire handled 218 lake sturgeon during surveys this spring. All anglers fishing for lake sturgeon must have a valid Wisconsin hook and line fishing license, along with a sturgeon hook and line harvest tag if they intend to keep a sturgeon. The harvest tag is available throughout the season and costs $20 for residents and $50 for nonresidents. Licenses and harvest tags are available for purchase online through GoWild.WI.gov and at any one of over 1,000 sales locations. Find a list of harvest waters, harvest registration stations and instructions for properly tagging a harvested fish on the Lake Sturgeon Hook and Line Season web pages. Anglers also will find a list of other waters where catch and release seasons are underway, including on sections of the Mississippi, St. Croix, and St. Louis rivers. Fisheries biologists who manage river stretches open for the hook and line harvest season say there will be exciting opportunities for both harvest and catch and release of lake sturgeon. 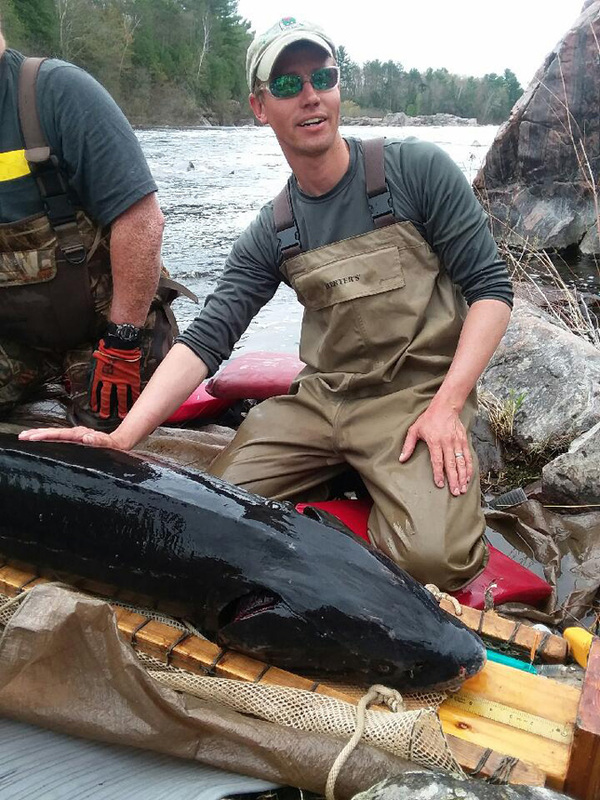 “Most anglers will continue to enjoy a mostly catch and release experience of undersized lake sturgeon on the Menominee River with a rare adult sturgeon over 60 inches,” says Mike Donofrio, fisheries supervisor in Peshtigo. Nate Nye, fisheries biologist stationed in Poynette, reports that populations of lake sturgeon in both Lake Wisconsin and the Wisconsin River below Prairie du Sac Dam remain strong. “Lake sturgeon smaller than 60 inches are relatively common (catch and release only); fish larger than 60 inches are not uncommon, and anglers may even encounter the occasional fish larger than 70 inches in either population,” he says. Joseph Gerbyshak, fisheries biologist based in Eau Claire, says that anglers will find a healthy sturgeon population to challenge them on the lower Chippewa River. Gerbyshak says the majority of fish harvested during the 2017 season were caught between Chippewa Falls Flowage Dam and the Dells Pond Dam. Anglers also reported catching numerous sublegal fish, a sign of a healthy sturgeon population. Night crawlers or cut bait presented in deep holes where there is current is a good combination for a successful sturgeon fishing trip, he says. Jeff Scheirer, fisheries biologist based in Park Falls, reports that lake sturgeon populations in the Chippewa and Flambeau rivers are healthy and produce a good hook-and-line fishery. Sturgeon often congregate in the impoundments and tailwaters of the dams along these systems, where anglers can enjoy fast-action, catch-and-release fishing, or wait for an opportunity to harvest a legal-size fish. In September 2017, anglers registered 12 sturgeon that measured at least 60 inches long, matching 2014 as the highest annual harvest in the Upper Chippewa Basin since more restrictive regulations took effect statewide in 2007, Scheirer says. Last season 10 sturgeon were taken from Flambeau River, one from the North Fork Flambeau, and one from the Chippewa River. The heaviest sturgeon weighed 58 pounds, and the longest sturgeon measured 65 inches. An average of about seven sturgeon are kept each season under the 60-inch limit, compared to about 72 sturgeon per year under the former 50-inch limit. As intended, the new rules dramatically reduced the harvest of females, allowing these late-maturing fish to reproduce more than once before reaching harvestable size.